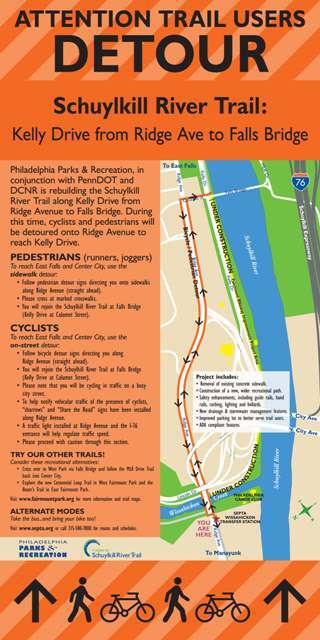 The re-construction of the Schuylkill River Trail along Kelly Drive between the Falls Bridge and Ridge Avenue (where Kelly Drive ends/begins off Ridge Avenue) will begin sometime during the first two weeks of March according to the Philadelphia's Dept. of Parks and Recreation. The trail will be closed sometime between now and March 14th. It will remain closed until the project is completed, but no later than June 30, 2011. The new trail will be 10 feet wide where there is enough room, and 8 or 9 feet where space is limited. The trail is going to be redirected to go behind the parking lot. Detour signs are going up today (February 24). Signs will be placed at the Wissahickon Transfer Station, the East Falls Bridge and Lloyd Hall. The google map below shows the detour that cylists and pedestrians will be asked to take, along Calumet and Ridge Avenue. Existing trail in blue; Detour in yellow/brown. Volunteers are welcome! Please contact Caroline if you would like to help hand out flyers during those hours. We will be the East Falls Bridge. The image of the Detour Handout is not all that legible even when enlarged. I'd suggest reporting it in a finer resolution.